[S286] Don Johnston, electronic mail to Roger Bartlett, 8 Sep 1997, (naming John Taverner as his father). [S286] Don Johnston, electronic mail to Roger Bartlett, 8 Sep 1997, (naming Elizabeth _____ as his mother). [S286] Don Johnston, electronic mail to Roger Bartlett, 8 Sep 1997. [S287] Don Johnston, electronic mail to Roger Bartlett, 9 Sep 1997, (naming Benjamin Winn as her father). [S287] Don Johnston, electronic mail to Roger Bartlett, 9 Sep 1997, (naming Ann Tavernor as her mother). [S287] Don Johnston, electronic mail to Roger Bartlett, 9 Sep 1997. [S287] Don Johnston, electronic mail to Roger Bartlett, 9 Sep 1997, (naming Benjamin Winn as his father). [S287] Don Johnston, electronic mail to Roger Bartlett, 9 Sep 1997, (naming Ann Tavernor as his mother). Birth*: She was born in 1750. Death*: She died in 1822. [S287] Don Johnston, electronic mail to Roger Bartlett, 9 Sep 1997, (naming Ann Durrett as his mother). Birth*: He was born on 13 April 1752. Death*: He died on 22 November 1823 at age 71. Marriage*: He married Martha Turpin. [S24] Victor L. Bennison, The Loop Family in America (n.p. : Penobscot Press, 1992), p. 62 (naming William B. Finch as her father). Mary Jane Fulton Loop's tombstone, Amity Cemetery, Amity, Ore., courtesy of Gary DeBlois. Other Names*: Mary Jane Fulton, Molly Fulton, Mollie Fulton, Mary Jane Fulton Loop, Mary Jane Loop, Molly Loop, Mollie Loop. 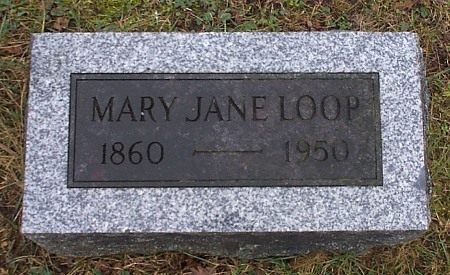 [S961] Find A Grave, online at http://www.findagrave.com, memorial for Mary Jane Loop, memorial no. 46494725, viewed on 7 Aug 2011. [S961] Find A Grave, online, above, memorial for Mary Jane Loop, memorial no. 46494725, viewed on 7 Aug 2011 (not giving the date or place). [S961] Find A Grave, online, above, memorial for John William Loop, memorial no. 9776626, viewed on 7 Aug 2011 (not giving the date or place). [S961] Find A Grave, online, above, memorial for Mary Jane Loop, memorial no. 46494725, viewed on 7 Aug 2011 (giving the year but no other information). [S961] Find A Grave, online, above, memorial for Joseph H. Loop, memorial no. 9776630, viewed on 7 Aug 2011 (naming Mary Jane Loop as his mother). [S961] Find A Grave, online, above, memorial for Robert C. Loop, memorial no. 9776627, viewed on 7 Aug 2011 (naming Mary Jane Loop as his mother). [S961] Find A Grave, online, above, memorial for Creed Fulton Loop, memorial no. 9776628, viewed on 7 Aug 2011 (naming Mary Jane Loop as his mother). 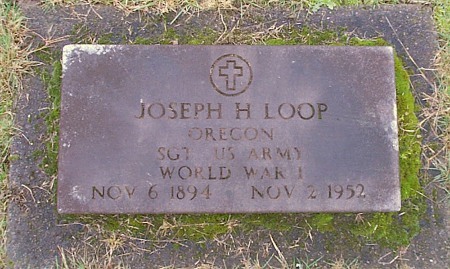 Joseph H. Loop's tombstone, Amity Cemetery, Amity, Ore., courtesy of Gary DeBlois. [S961] Find A Grave, online at http://www.findagrave.com, memorial for Joseph H. Loop, memorial no. 9776630, viewed on 7 Aug 2011 (naming Mary Jane Loop as his mother). [S961] Find A Grave, online, above, memorial for Joseph H. Loop, memorial no. 9776630, viewed on 7 Aug 2011 (naming John William Loop as his father). [S961] Find A Grave, online, above, memorial for Joseph H. Loop, memorial no. 9776630, viewed on 7 Aug 2011. [S961] Find A Grave, online, above, memorial for Joseph H. Loop, memorial no. 9776630, viewed on 7 Aug 2011 (according to picture of tombstone). [S558] Kathleen Paul Jones and Pauline Jones Gandrud, comps., Alabama Records (Easley, S.C.? : Southern Historical Press, 1980), vol. 3, p. 28 (naming William L. Dupey as her father and citing Records of Orphans Court, Tuscaloosa Co., Ala., bk. 1, p. 73). [S290] Dr. W. A. Evans, Monroe County, Mississippi Cemetery Records (Columbus, Miss. : Lowndes County Department of Archives and History, 1980), p. 10. [S558] Kathleen Paul Jones and Pauline Jones Gandrud, comps., Alabama Records, above, vol. 3, p. 28. [S290] Dr. W. A. Evans, Monroe County, Mississippi Cemetery Records, above, p. 10 (stating that grave marker identifies her as "wife of John T. Fortson"). [S1055] "University of Alabama Record of Students," The Alabama Genealogical Register, vol. III, no. 4, p. 173 (Dec 1961), at p. 178 (giving her name as Lizzie). [S767] John and Mary Williams, chart of descendants of Frederick Fortson, online, http://www.castlegate.net/howse/fortson/fortrept.htm, viewed on 14 Sep 2002 (naming Eliza DuPuy as his mother). [S290] Dr. W. A. Evans, Monroe County, Mississippi Cemetery Records, above, p. 10 (stating that her grave marker identifies her as "daughter of J. T. and Eliza Fortson"). [S290] Dr. W. A. Evans, Monroe County, Mississippi Cemetery Records (Columbus, Miss. : Lowndes County Department of Archives and History, 1980), p. 10 (stating that her grave marker identifies her as "daughter of J. T. and Eliza Fortson"). [S290] Dr. W. A. Evans, Monroe County, Mississippi Cemetery Records, above, p. 10. 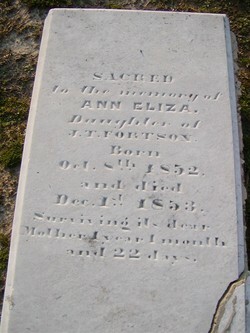 Ann Eliza Fortson's tombstone, Old Aberdeen Cemetery, Aberdeen, Miss., from findagrave.com, by Michelle Woodham. [S290] Dr. W. A. Evans, Monroe County, Mississippi Cemetery Records, above, p. 10 (giving the year but no other information). [S961] Find A Grave, online at http://www.findagrave.com, memorial for Ann Eliza Fortson, memorial no. 18553208. [S292] Clara Moore Moody, "James McAllister," in A History of Monroe County, Mississippi, vol. 1 (n.p. : Monroe County Book Committee, 1988), p. 659, (naming Ulysses S. McAllister as his father). [S292] Clara Moore Moody, "James McAllister," above, (naming Sarah F. Fortson as his mother). [S292] Clara Moore Moody, "James McAllister," above, (giving only the date). [S293] Margaret Ruth Yeates Robertson, "McAllister Family," in A History of Monroe County, Mississippi, vol. 1 (n.p. : Monroe County Book Committee, 1988), pp. 658-59. [S767] John and Mary Williams, chart of descendants of Frederick Fortson, online, above, viewed on 14 Sep 2002 (stating that he was a first sergeant in the Reuben Davis Rebels of the Confederate Army). [S853] Mary Williams, electronic mail to e-mail address, 18 Jan 2001. [S295] Clara Moore Moody, "McAllister Family" (number F625), in A History of Monroe County, Mississippi, vol. 1 (n.p. : Monroe County Book Committee, 1988), pp. 657-58. [S295] Clara Moore Moody, "McAllister Family" (number F625), above, (naming Barnabas McAllister as his father). [S295] Clara Moore Moody, "McAllister Family" (number F625), above, (naming Barnabas McAllister as her father). [S767] John and Mary Williams, chart of descendants of Frederick Fortson, online, http://www.castlegate.net/howse/fortson/fortrept.htm, viewed on 14 Sep 2002 (naming Elizabeth Moore as his mother). [S295] Clara Moore Moody, "McAllister Family" (number F625), above, (naming Elizabeth _____ as her mother). [S293] Margaret Ruth Yeates Robertson, "McAllister Family," in A History of Monroe County, Mississippi, vol. 1 (n.p. : Monroe County Book Committee, 1988), pp. 658-59, (naming Dr. George Higgason as his father). Marriage*: She married Dr. George Higgason. [S293] Margaret Ruth Yeates Robertson, "McAllister Family," in A History of Monroe County, Mississippi, vol. 1 (n.p. : Monroe County Book Committee, 1988), pp. 658-59, (naming Mary Davis as his mother). [S293] Margaret Ruth Yeates Robertson, "McAllister Family," in A History of Monroe County, Mississippi, vol. 1 (n.p. : Monroe County Book Committee, 1988), pp. 658-59, (naming Edmond Ironsides Higgason as his father). [S294] Wanda Norvell Flynn, 26925 Cougar Pass Rd., Escondido, Rt. 6, Calif. 92026, letter to Roger Bartlett, 19 Sep 1997, (naming George Norvell as his father). [S294] Wanda Norvell Flynn, 19 Sep 1997 letter, above. [S294] Wanda Norvell Flynn, 19 Sep 1997 letter, above, (naming George Norvell as her father). [S294] Wanda Norvell Flynn, 26925 Cougar Pass Rd., Escondido, Rt. 6, Calif. 92026, letter to Roger Bartlett, 19 Sep 1997. [S294] Wanda Norvell Flynn, 19 Sep 1997 letter, above, (naming Nancy Hudnall as his mother). [S396] Wanda Norvell Flynn, 26925 Cougar Pass Rd., Escondido, Rt. 6, Calif. 92026, letter to Roger Bartlett, 13 Mar 1998, (naming Nancy Hudnall as his mother). [S294] Wanda Norvell Flynn, 19 Sep 1997 letter, above, (naming Nancy Hudnall as her mother). [S294] Wanda Norvell Flynn, 26925 Cougar Pass Rd., Escondido, Rt. 6, Calif. 92026, letter to Roger Bartlett, 19 Sep 1997, (naming James Norvell as his father). [S294] Wanda Norvell Flynn, 19 Sep 1997 letter, above, (naming Anna Norvell as his mother). [S396] Wanda Norvell Flynn, 13 Mar 1998 letter, above, (naming George Norvell as his father). [S294] Wanda Norvell Flynn, 19 Sep 1997 letter, above, (naming George Norvell as his father). [S396] Wanda Norvell Flynn, 13 Mar 1998 letter, above, (naming George Norvell as her father). Marriage*: He married Anna _____. Marriage*: She married James Norvell. [S294] Wanda Norvell Flynn, 26925 Cougar Pass Rd., Escondido, Rt. 6, Calif. 92026, letter to Roger Bartlett, 19 Sep 1997, (naming Anna Norvell as his mother). Marriage*: He married Mary Knott. Marriage*: She married James Norvell Jr., son of James Norvell and Anna _____. [S294] Wanda Norvell Flynn, 26925 Cougar Pass Rd., Escondido, Rt. 6, Calif. 92026, letter to Roger Bartlett, 19 Sep 1997, (naming George Norvell as her father). [S7] Navarro County, Texas Marriages, vol. 1, 1846-1888 (Corsicana, Tex. : The Navarro County Gen. Soc'y, 1987), p. 9 (citing Navarro Co., Tex. Marriage Records, vol. I, p. 6) (giving her name as Mary I. Norvill). [S7] Navarro County, Texas Marriages, vol. 1, 1846-1888 (Corsicana, Tex. : The Navarro County Gen. Soc'y, 1987), p. 4 (citing Navarro Co., Tex. Marriage Records, vol. A, p. 93). [S43] Marriage Records, Navarro County, Tex., vol. A, p. 92. [S7] Navarro County, Texas Marriages, vol. 1, 1846-1888 (Corsicana, Tex. : The Navarro County Gen. Soc'y, 1987), p. 10 (citing Navarro Co., Tex. Marriage Records, vol. I, p. 98). [S293] Margaret Ruth Yeates Robertson, "McAllister Family," above, (naming Burgess Burkitt as his father). [S293] Margaret Ruth Yeates Robertson, "McAllister Family," above, (naming Burgess Burkitt as her father). [S293] Margaret Ruth Yeates Robertson, "McAllister Family," in A History of Monroe County, Mississippi, vol. 1 (n.p. : Monroe County Book Committee, 1988), pp. 658-59, (naming Burgess Burkitt as his father).